Well this is old news, but I thought I would share it with you anyhow. 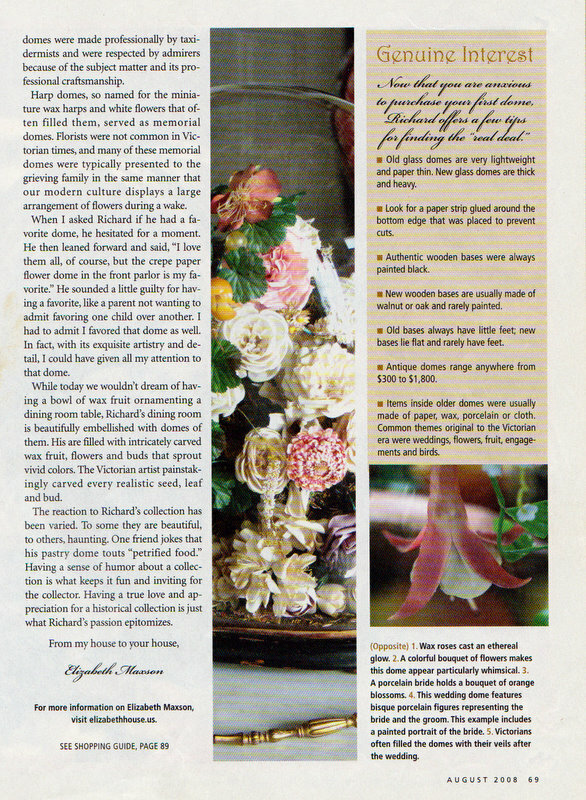 My Friend, Elizabeth Maxson , from St.Louis, and, Elizabeth House Blogspot, used to write for Romantic Homes Magazine. She wrote this article and it was published in August 2008. I was very proud and pleased that this happened, as it was the first time, My old Historic House, was published. It has been in several magazines since, but the first is always a great send off. 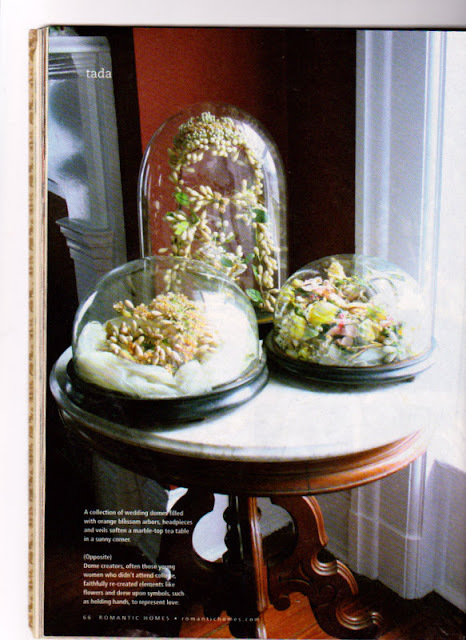 It was a cold day in January when Elizabeth drove all the way from St.Louis to Clarksville ,70 miles, to take pictures of my Victorian Parlor Dome Collection. I could not go, as I was working. I gave her a key and sadly gave up the rights to be there during this artistic process.Being a decorator and trained artist, it is hard to not be in the final judgement of the picture taking process.This is called," control", and I did not have it. Anyhow, I did give her the key and the rest is history. Elizabeth had told her editor at the magazine about my domes and her ideal to do an article about them. Unlike some writers, Elizabeth takes her own pictures. She uses natural light. 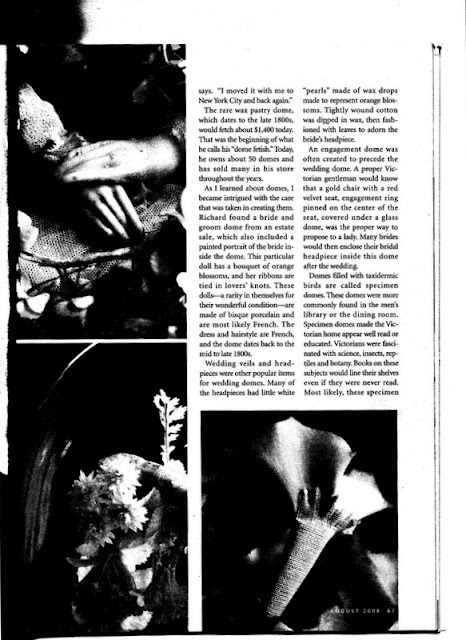 So with all that in mind, I think the article came out beautifully. I had a couple of rooms unfinished at the time she took these pictures. Well Elizabeth is a very, how shall I say it, Shabby Chic kinda girl. The unfinished rooms really appealed to her. Cracked walls and peeling paint and wall paper. I was in constant fear that when the article appeared it would show these rooms. I gave her a blank canvas you see. Well where she did love these rooms and she did take photos there, she was kind to me and showed the better part of my house. 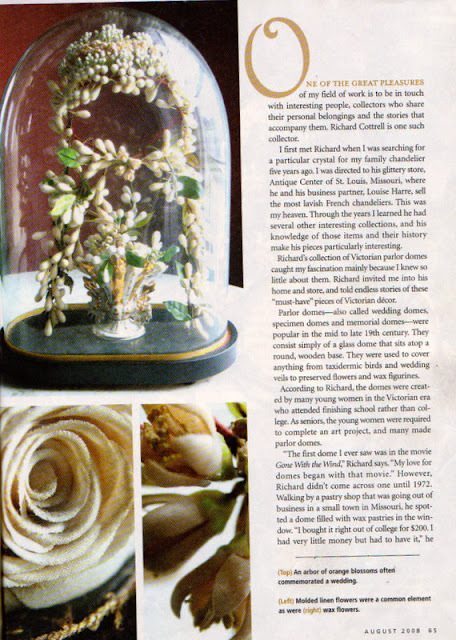 I love the article, I think she did a wonderful job. I have to say, I was a little sad as it did not show more of the house. 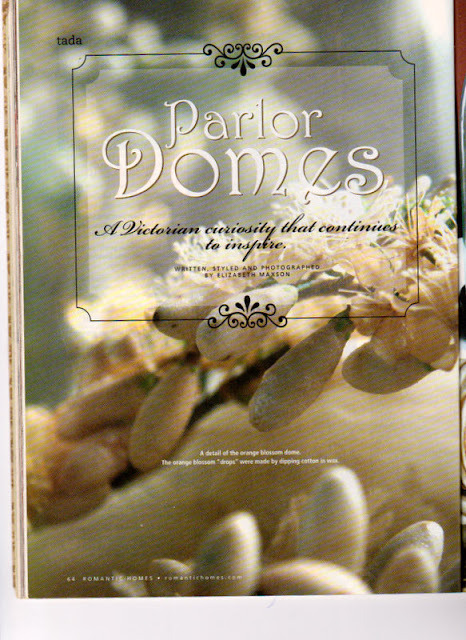 I have to remind myself, that the article was about the Parlor Domes, not the house. With that in mind, I gave her an A+. Some how, during the years, I had lost my copy. In fact, I had kinda of forgotten about this article. My neighbor was going through magazines , came across it. She asked me if I 'd like it and of course I was thrilled. 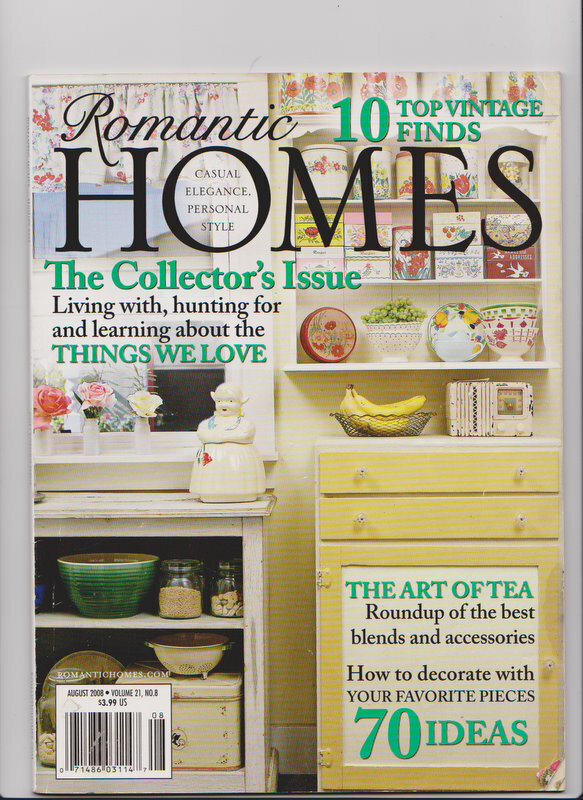 I have since added it to the collection of other magazines that features my house.I keep them open to the right page on the library table, Doesn't seem to hurt and usually does a little of impressing to point them out, when I give tours. What a brat I am. Sorry. No I am not!!!!! I was cleaning this morning, well if that is what one would call it. I took my sleeve and ran it across the library table. Yikes!!! I saw this magazine and thought it would make a nice blog post. Hope you enjoy. I tried my new printer scanner for the first time. I have never done this before. 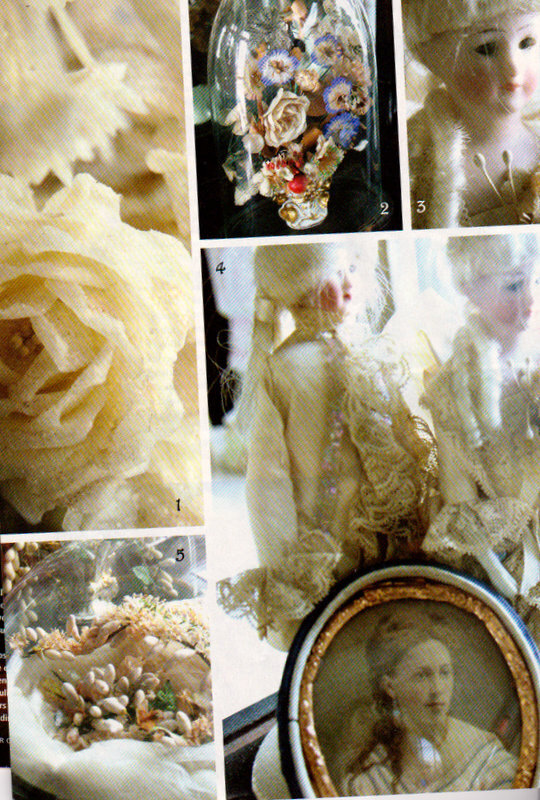 The darling thing, scanned them and sent them right to Picasa, where I downloaded them into a file. It was so easy and amazing. A whole new world has come into my blog head. I know it can be better and I promise to do that in the future. I love this computer. That is coming from a person who will not own a cell phone or buy anything that takes a battery. Go figure! I hope maybe some day you all can come and take a real tour. In the mean time, keep on reading. I will always have a light on and Sissy Dog will meet you with a jump and a kiss. I love comments, that's why I do this, so leave me one and you will get one back. Have a beautiful day! !